Week in review – energy edition | Climate Etc. Nobel prize winning physicist de Gennes said of nuclear fusion,” The pretty idea is to put the sun in a box. The problem is, we don’t know how to make the box.” Hawkins black hole idea “needs a bit of work” is the funniest understatement of the century. I’ve been telling nuclear power cheerleader Peter Lang this for *years*. As I recall it you’ve been arguing against nuclear, not for it, and you’ve been saying it is too expensive. I’ve been explaining that the high cost is due to regulatory ratcheting resulting from 50 years of anti-nuke fear mongering like you post continually. You have not been “telling” me that at all. You have been arguing against, not for nuclear power. Most of your arguments are irrational scaremongering, but you also argue it is to expensive. I’ve been arguing it is too expensive because of regulatory ratcheting (which is applied globally through the IAEA). The regulatory ratcheting is a consequence of the 50 years of irrational anti-nuke scaremongering and disinformation, scaring the pants of the population, and blocking progress. Apologies for double post, The first disappeared, then reappeared after I’d posted the second attempt. •	This https://judithcurry.com/2016/01/19/is-nuclear-the-cheapest-way-to-decarbonize-electricity/#comment-759084 explains a suggestion for a catalyst to get people to reconsider their fear of nuclear power so a faster learning rate can be achieved in future. China is building 8 sets of reactor equipment a year by plan. This doesn’t include reactors they buy. By 2025 China will have at least as many reactors as the US. We can look at the Chinese price curve in 2025 to see what the cost trend is for nuclear power without insane anti-nuker regulation. This will inform us on what the true cost of ill advised regulation was. In the 60s the US nuclear construction cost was around $1 per We in current dollars. So it seems likely the Chinese will achieve $1 per We in current dollars or even less. No renewable energy source can compete with low capital cost nuclear. What I’ve been telling you, Lang is that your theory about nuclear power being strangled by excessive costs is wrong. I specifically said that non-western nations don’t have the regulatory burdens the US suffers under and if nuclear were all that great then those nations would be taking advantage of it. They aren’t. If you weren’t a cheerleader blind to anything that doesn’t match your pompoms and short skirt you might wonder why countries without excessive regulatory burdens like say Russia, China, and India aren’t bursting at the seams with affordable electricity made possible by nuclear reactors. So this article Judy linked is a cost study of nuclear power plants that includes those in non-western nations and it agrees with what I’ve been saying about those countries not being impaired by regulatory burdens. Peter Lang I have NOT been arguing against nuclear power. I have been presenting unbiased objective facts and observations about it. No one more than me would love the 1960’s promises of electricity “too cheap to meter” coming true from nuclear power. The plain fact of the matter is that did not and is not likely to happen and it isn’t due to excessive regulatory burdens as you continually claim. The reason why is that some countries don’t have much at all in the way of regulatory burdens and it isn’t helping them. Actually, the article says that south Korea’s nuclear program shows a decrease of the costs as the installations went on. I think you should read the papers you link and comment. What I’ve been telling you, Lang is that your theory about nuclear power being strangled by excessive costs is wrong. I specifically said that non-western nations don’t have the regulatory burdens the US suffers under and if nuclear were all that great then those nations would be taking advantage of it. They aren’t. f you weren’t a cheerleader blind to anything that doesn’t match your pompoms and short skirt you might wonder why countries without excessive regulatory burdens like say Russia, China, and India aren’t bursting at the seams with affordable electricity made possible by nuclear reactors. Springer, it’s not possible to have a rational discussion with you on nuclear matters, so I’ll write this for the benefit of others. Q1. Why are the experience curve/learning rate/progress ratios for nuclear anomalous when compared with other technologies? Q2. Why were the cost reduction rates in the first phase of nuclear power (1950s to about 1970) around -80% total change in OCC (for the countries that started in the 1950s), whereas the it was much less and even negative in the later phases (since about 1970)? PL Comment: The cost reduction rates in the first phase were roughly consistent with other technologies. The later phases are anomalous. What’s the reason? What’s different about nuclear? The obvious stand-out difference between nuclear energy and other technologies is the public’s irrational fear (paranoia?) about nuclear energy. This has been caused by 60 years of anti-nuke scaremongering and disinformation about anything to do with nuclear energy and radiation. Springer’s opinion that regulatory ratcheting (resulting from the public’s fear of it) is not the cause of the anomalous cost reduction rates for nuclear power ignores the relevant facts. IAEA enforces the regulations globally and these have been largely controlled (influenced) by the USA and to a lesser extent other western nations that have developed nuclear power designs and to an even lesser extent by all members of the IAEA. There regulations are applied to all countries building nuclear power plants (e.g. new starter UAE). Going back to the beginning, the US decided on LWR’s for nuclear powered submarines and this and the experience gained with them gave an advantage to LWR’s for development for electricity generation. The US lead the way and has strongly influenced which technologies are developed and which are not supported, so the nuclear technologies used now throughout the world are mostly derived from the US reactor types (and some from Russia). Other technologies are in the early stages of RD&D, commercial deployment of these has not begun. The point is that the regulations that have controlled the development of the current designs are entrenched in the designs used throughout the world and enforced by IAEA. We can argue about details and nit-pick about particular bit’s I’ve said here, but this is the big picture. “The South Australian Royal Commissioners looking into nuclear energy and politicians both state and federal should read Nuclear is for Life by Wade Allison. It is a “tour d’horizon” of the scientific understanding of radiation and the human body. It should also be read by all the NGO and green activists who assembled in Paris last November in the City of (nuclear) Lights. The simple central message of this book is that we have been mistaken about the hazards of nuclear power. Some of this has been willful and some well-intentioned. Fukushima, Chernobyl, Three Mile Island, weapons tests and the bombing of Hiroshima and Nagasaki are all discussed. The subsequent histories of those exposed to radiation are followed and in some cases compared to those who were present but not exposed. For nuclear power stations only Chernobyl stands out with the death of those who actually fought the fire at the reactor and the children who got thyroid cancer from radioactive iodine in cows’ milk. The latter was due to the inaction of Soviet authorities to a well-known radiation danger. The biggest health hazard for both Chernobyl and Fukushima was the extraordinary mental stress placed on those who were moved from their farms and houses. This problem was identified at Chernobyl but the action was repeated at Fukushima. Wade Allison draws some comparisons with the radiation treatment of cancers where doses are enough to kill the cancerous cells but the surrounding tissues with lesser doses recover. Another interesting comparison is our attitude to skin cancer, melanoma, and UV light. More deaths arise from the UV radiation than the estimated risk let alone the occurrence of cancers from nuclear radiation. We don’t stay in the dark but rather try to take sensible precautions during our summers but the risk of cancer remains. Our living cells are a result of over two billion years of surviving and evolving to give reproductive protection for cell division and for us animals an immune system to police the behaviour of cells. All this has occurred in an environment where radiation was ever present. This leads to an assessment of the present regulatory limits set for safe radiation exposure. In brief, for living tissues, the present regulatory approach is wrong. Living tissue repairs itself. The Precautionary Principle is dealt with and then dismissed. This follows Lord Kelvin’s advice that nothing was worth discussing until reduced to numbers. Finally “the Great and the Good” are put in their place. There is a splendid example of Linus Pauling writing to President Kennedy with a catalogue of radiation-induced abnormalities amongst new born babies. It is now clear that Linus Pauling was wrong. It is unfortunately not remarkable as Silent Spring – DDT mosquitoes and the environment (think Zika virus), the Club of Rome – resource limits, The Population Bomb – food shortages and riots, The Cooling – a new ice age and now innumerable books and reports on climate change have all been supported by groups wanting to do good who frequently knew nothing of the actual scientific or technical issues but took the opinion of experts. Over time this has demonstrated one of Richard Feynman’s rules that the business of science is proving the experts wrong. Australia does not escape the reach of this book. Neither Nevil Shute’s On the Beach nor Helen Caldecott get a favourable review. * Tom Quirk is a director of Sementis Limited a privately owned biotechnology company. He has been Chairman of the Victorian Rail Track Corporation, Deputy Chairman of Victorian Energy Networks and Peptech Limited as well as a director of Biota Holdings Limited. He worked in CRA Ltd setting up new businesses and also for James D. Wolfensohn in a New York based venture capital fund. He spent 15 years as an experimental research physicist, university lecturer and Oxford don. The fact that cheaper nuclear power stations cannot be licenced, is slowing the rate of deployment of cleaner, safer electricity to the world and causing hundreds of thousands of avoidable fatalities per year. If you weren’t a cheerleader blind to anything that doesn’t match your pompoms and short skirt you might wonder why countries without excessive regulatory burdens like say Russia, China, and India aren’t bursting at the seams with affordable electricity made possible by nuclear reactors. Huh? China has at least 5 different nuclear reactor types under development. They are working on LFTR, 3 PWRs, an LMFR, and 2 modular prototypes. The 200 MW HTG (100 MW modular twin).is starting the site install for the commercial demonstrator (unit 1). Plus there are the export variants of some of the above. LMFR (lead based fast reactor in prototype). They are building reactor hardware for their current PWR at 8 copies a year. They aren’t bursting at the seams with nuclear now – but give it time. By 2025 they will have more commercial reactors in the ground than the US. But it’s Stephen Hawking!!! Just having a little fun. Obviously most should quickly see that this is an idea that can not even under the most generous assumptions be considered feasible for a long, long, long, … time. But it is not so different from many other ideas that get advanced by brilliant people and then promoted by others on their authority. There is a lot of energy in the sky. We will not soon harvest it through flying turbines kites or cables returning electrical charges. Efficiency could do great things that it won’t ever be able to accomplish. A giant US or world grid might enable intermittent resources to match demands. Smaller microgrids could eliminate big grids through technology and local resources. Electric cars when charging can serve as batteries to stabilize the grid. 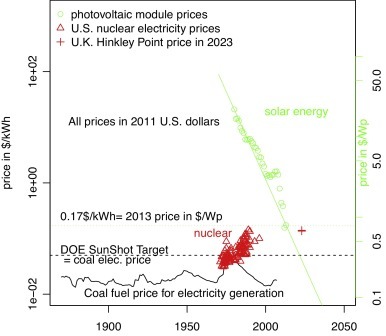 Technological improvements for Solar may follow Moore’s law. Bright people can speculate and theorize on a lot of things. Such exercises can be worthwhile. But ideas originating from “prestigious” sources are not always practical (and often they are not intended to be taken that way). The point here was it takes more than an idea that sounds desirable paired with a prestige source to make a credible argument. I mean whose smarter than Stephen Hawking. Yet often you see appeals to authority based upon in supposed “experts” with little connection to the real world. Sometimes the qualifiers are not much more sophisticated than my “will need a bit of work” comment. A more realistic understanding of their ideas can get you labelled as ignorant, unaware, hard headed, immoral or worse. And just to be clear I’m near certain Stephen Hawking did not intend his observations to impact energy policy at this time, but if he did – I’m sure he could make me look foolish for doubting his proposal. Technology may follow that, but the hard limit of low-power density intermittent renewables (few W/m2) is the maximum amount of power extractable from the sources, i.e. wind and sun, under very stringent social and environmental constraints. Several papers have already shown how wind power potential, when correctly calculated via a top-down analysis, is limited to few TW of extractable power, i.e. much less than the few tens of TW needed by mankind in the future. Solar on his part is severely limited in its expansion by its large seasonal power excursions, and the consequent needs for long-term storage of huge quantities of electricity. This does not mean, of course, that few selected countries fulfilling specific conditions may not be able to use and integrate large quantities of intermittent REN sources, but at the global scale the limits are already clear and set. floor – effective, efficient, evolutionary, as in nay-chur. Technological improvements for Solar may follow Moore’s law. This notion comes by analogy with IT, for which Moore’s “law” was originally formulated. Technically, the name for the PV equivalent is “Swanson’s Law”. The first bolded part has important policy implications: policies that encourage more rapid roll-out of solar PV for any reason would, per Wright, result in even faster cost declines. Some of those policies would not involve new subsidies, even at the expense of non-solar rate-payers. 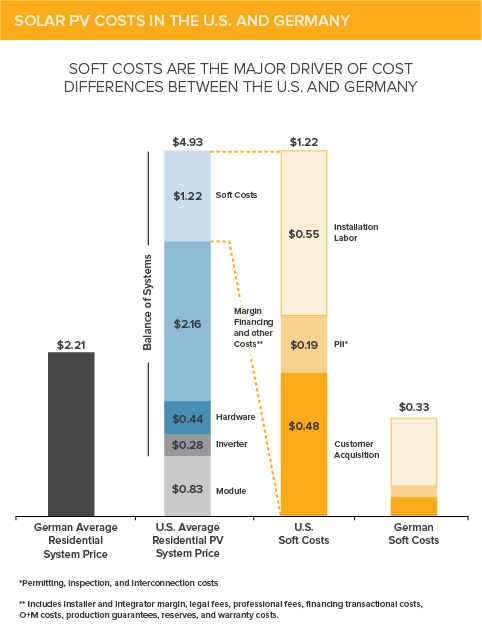 Streamlining the permitting process, and removing regulatory barriers derived from pre-solar construction traditions, would likely bring the US much closer to Germany in soft costs. Pictures above are from here. The ITIF (and other think tanks along with it) have taken sides in the current trade dispute, arguing that the U.S. Department of Commerce and the companies urging it forward (a coalition led by SolarWorld) are simply trying to enforce the rules of global competition, while the green mercantilists [China] are threatening the survival of the rest of the industry. The problem with this position is that it ignores the reasons for China’s success. Chinese firms are not “dumping” product on the rest of the world, but are benefiting from the cost advantages they have reaped through scaling up production. This is a time-honored approach to reducing costs and enlarging the market, perfected in the United States ever since it was applied so effectively by Henry Ford to the (at the time) luxury automotive market. An exclusive focus on “innovation” as a form of public policy ignores the fact that newcomers need support to expand their market at the scale needed to drive down costs. Strong government action is needed to break down the barriers. This is what has been conspicuous by its absence in the United States. And I suppose this, or the fact that Chinese manufactures have minimal polution controls, has nothing to do with it. I suppose this, or the fact that Chinese manufactures have minimal polution controls, has nothing to do with it. [… T]he boom in photovoltaics demanded more than semiconductor-industry leftovers, and many new polysilicon refineries were built in China. Few countries at the time had stringent rules covering the storage and disposal of silicon tetrachloride waste, and China was no exception, as some Washington Post reporters discovered. After the publication of the Washington Post story, solar companies’ stock prices fell. Investors feared the revelations would undermine an industry that relies so much on its green credentials. To protect the industry’s reputation, the manufacturers of photovoltaic panels began to inquire about the environmental practices of their polysilicon suppliers. Consequently, the situation is now improving. In 2011 China set standards requiring that companies recycle at least 98.5 percent of their silicon tetrachloride waste. Doping yields hydrofluoric acid. Popular types of thin-film use cadmium, a poison, and tellurium, so rare that significant up-scaling could cause worse strip-mining blight than coal. Proton beam exfoliation, a new high-potential technology for driving down silicon costs, uses sulfur hexa-fluoride, a potent greenhouse gas. These problems need to be recognized and addressed. But the current system of Chinese “capitalism” includes substantial western investment, which is sensitive to such “non-green” issues. So the incentive is there to address it. And, AFAIK, the Chinese consider laxness of this sort as corruption, which means they’ll punish it with the death penalty (sometimes). A strong incentive. You often write about Moore’s Law, “Swanson’s Law”. and now Wright’s law. Could you calculate what price electricity would be now if nuclear power had been allowed to follow Moore’s, Swanson’s and Wright’s Laws since the start? France added 45 GW capacity in 10 years in the 1980’s. Figure A.8. Nuclear Power Total Capacity. Total capacity additions (left-hand axis) and cumulative total capacity (right-hand axis) of nuclear power, globally and dis-aggregated into 4 regions. [Data from (Platts 2005); see text for details]. AK, with your analytical skills, can you combine these, as best you can, and tells us how much the costs (Overnight capital cost) would have declined by now if the the Moore’s Law, “Swanson’s Law”. and Wright’s laws had been followed from the start. Could you calculate what price electricity would be now if nuclear power had been allowed to follow Moore’s, Swanson’s and Wright’s Laws since the start? Not right off the cuff. A pretty big project, especially considering the 119-page document you recommended. The “negative” learning curve for nuclear shows clearly here. It would appear (IMO) that the anti-nuclear blocks were also experiencing a learning curve: learning how to throw new roadblocks into the way of nuclear faster than the engineers could design around them. But an easy off-the-cuff estimate could be made by starting with the first nuclear power plant, and continuing the line downward at half the slope of solar PV. At that rate, electricity from nuclear power would be around 1¢/watt today. Very roughly. As you can see, there’s a sudden jump in plant costs in the wake of Three Mile Island (1979), and especially Chernobyl and the Challenger Disaster (1986). It’s important to recognize the difference between Moore’s “law”, which is exponential with time, and Wright’s “law” which states a log/log relationship between cumulative production and price drop. For solar PV (among other technologies) dropping prices tend to encourage deployment in new situations that wouldn’t have been cost-effective at prior prices. This creates a positive-feedback reaction driving cumulative production/deployment. With the actual “negative learning curve” of nuclear, no such positive feedback takes took place. So to create a “what-if” scenario for nuclear power, it’s necessary to assume that reductions in cost would have driven a rapid increase in deployment, in contrast to what happened. I’d say a penny a watt would be a good ballpark. A very rough ballpark. Sorry, I should have included the link to the paper we’ve been discussing on this thread and linked in Judith’s post: Lovering et al., 2016, ‘Historical construction costs of global nuclear power reactors‘ http://www.sciencedirect.com/science/article/pii/S0301421516300106 . This is the main source of data as I explained in my question. I am not interested in going off on a tangent or following you down rabbit holes. I’ve been dealing with this stuff for 30 years. I am seeking an answer to my specific question, so please either answer my question or say you can’t or don’t want to. I don’t really see how any “what-if” calculation going back to the early post-WWII years could be anything but going “down rabbit holes.”. Invariably, such an analysis will be sensitive to many questionable assumptions. But a quick guess, using Wright’s “law” based on existing capacity and fig. 13 of your linked Lovering, Yip, and Nordhaus (2016), would be $200-300(2010)/kW. This is achieved by taking the trend for US experience through about 32 GW global capacity, and extending it to the current point of ~256 (as opposed to the sudden rise probably caused by reaction to Three Mile Island). Between 1954 and 1968, starting with the first reactor at Shippingport, 18 demonstration reactors were ordered and completed. In this first phase, overnight construction cost (OCC) decline sharply, from a high of $6800/kW to a low of $1300/kW, an 81% drop, or an average annualized rate of decline of 14%. In this period, reactor size increases from under 80 MW to 620 MW, suggesting economies of scale were important. The second phase, from 1964 to 1967, represents the era of turnkey contracts. The OCC of these 14 reactors are in the range of $1000-1500/kW, a 33% drop, or an average annualized rate of decline of 13%. In this period, reactor sizes increase to a range of 800–1100 MW. I made two assumptions for Moore’s “law”, 13%/year based on turnkey (1964-1967) and consistent with the higher (14%/year) figure for early demonstration. Then I tried 10%/year, to allow for some level of technological innovation, applied to a maturing technology. In line with the paper I linked above, I assumed that if both Moore’s “law” and Wright’s “law” applied the final global installed capacity would be such as to support both curves, resulting in huge (probably unreasonable) install bases. I used a 40-year period (1967-2007) for ease of calculation. I used an assumed global capacity for 1967 of 32 gigaWatts at $1000(2010)/kiloWatt as the starting point, based on their figure 13. For 13%/year, my rough result was $3.80(2010)/kiloWatt @ 2048 teraWatt global capacity. For 10%/year, my rough result was $14.78(2010)/kiloWatt @ 128 teraWatt global capacity. Your mileage may vary. You could assume a sigmoid growth curve and level it off at whatever point you like, or start with a much smaller annual growth rate. You’ve lost me. 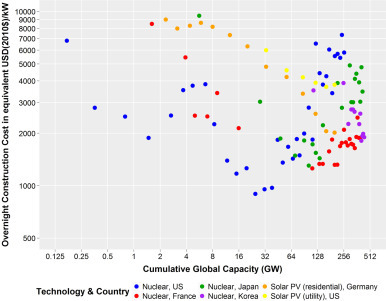 A rough eyeballing from Figure 13 suggest the OCC trend from start to about 40 GW global capacity would project to about $500/kW at current global capacity (right side of chart). That is, nuclear OCC would now be about $0.5/W if the regulatory ratcheting had not occurred. Given that the system costs for nuclear are much lower than for wind and solar and the capacity factor is some 3 (wind) to 5 or more (solar) times higher, it should be evident to most rational people that nuclear is much cheaper than weather dependent renewables. A rough eyeballing from Figure 13 suggest the OCC trend from start to about 40 GW global capacity would project to about $500/kW at current global capacity (right side of chart). Well, we’re not that far apart. I stopped at 32 GW, and projected $200-300. I certainly agree that if that learning curve had been allowed to work, nuclear would be competitive enough with solar to probably out-compete it. But I’m not sure that the actual experience under highly inimical regulations could justify such costs, without at least a decade or so of experience under new, unregulated conditions. Well, we’re not that far apart. I stopped at 32 GW, and projected $200-300. OK AK, Yes, we are in the same ball park. I hadn’t understood what you were saying. I certainly agree that if that learning curve had been allowed to work, nuclear would be competitive enough with solar to probably out-compete it. But we are miles apart here. I expect the LCOE for solar, based on total system cost, would be very much higher than nuclear at sufficient penetration to significantly reduce CO2 emissions intensity of the electricity system, let alone achieve deep decarbonisation such as equivalent of France (42/g/kWh in 2014). I don’t understand this comment. Please explain what you mean. OK. Whatever the source of the relationship in Wright’s “law”, often called “learning curve”, it’s not magical. There is something about the continuous growth of cumulative production that causes production costs to drop in a log/log relationship. AFAIK there’s no consensus what it is. But whatever it is, it would be unwarranted (IMO) to assume that all the “experience” from building in a hostile regulatory environment would translate to building under more rational political constraints. (Of course, it would also be unwarranted to assume that it wouldn’t.) Thus, I would call it an open question whether relaxing the regulation would result in immediate cost reductions to what would have been true from Wright’s “law” in a more friendly regulatory environment. Thus, I would call it an open question whether relaxing the regulation would result in immediate cost reductions to what would have been true from Wright’s “law” in a more friendly regulatory environment. I’ve repeatedly said it will take decades to wash out of the system all the costs that have been imposed by 50 years of anti-nuke scaremongering, disinformation and the regulatory ratcheting that has been implemented as a result of that. I am not saying that removing the regulatory impediments to nuclear development is an overnight fix. But the point is that nuclear is the only realistic long term solution to future safe, clean, unlimited energy supply and it is the quickest and cheapest way to achieve deep decarbonisation. But deep decarbonisation won’t happen globally unless low emissions energy is cheaper than high emissions energy. Therefore, to achieve deep decarbonisation globally those advocating for it should be advocating for cheap low emissions energy. The only realistic solution is nuclear. Renewables cannot do much. ThorCon’s approach, for instance, is very interesting. Yes. Most definitely. That’s an excellent example of where we need to get to. But no one technology should be picked for support. All the ~50 new small modular reactor designs being developed by organisations throughout the USA should compete on a level playing field. The critical issue is to remove the regulatory regime and entrenched public fear that are massive impediments to development of low cost safe nuclear power. This includes removing the distortions such as the incentives for renewables. This provides and example of what could be done with nuclear too if we wanted to – similar to a factory building large commercial aircraft (e.g. Boeing, Airbus). The Nature Energy piece is utterly disappointing and naive. Talks about wind and solar without discussing the intermittency problem. The several fallacies in the NE hydrogen discussion were explored in essay Hydrogen Hype. The realistic limitations on biofuels that NE did not cover were explored in essays Salvation by Swamp and Bugs, Roots, and Biofuels. The Nature stable of publications has now fallen further in stature, publishing unscientific twaddle. I like the greentechmedia “flotation” artice even better. They start with nuclear, which makes sense, but then they venture into wind and solar. I imagine a far-offshore power plant, delivering a shipload of electricity and a shipload of drinking water once a week. The “carbon-negative” is a new way to sell biomass. What makes it carbon-negative they don’t say, but a big plant producing coal from biomass would be nice. How much energy that process would consume they don’t investigate. I totally agree with you. It is simply a PR piece for renewables… nothing more nothing less. I have the impression that Nature’s editorial system has been hijacked by green infiltrators since a while now… and this new journal is simply going to be another weapon in their hands, I sincerely hope I will turn out to having been wroing in this assessment.. but…. Anyway… if this is the level and quality of the papers they will publish it may backfire against their cause, that’s for sure. Proof is the ridiculous treatment and analysis of nuclear power, at the very end of the article, as if it were an “also ran” technology… coming to exactly opposite conclusions with respect to the excellent Energy Policy paper linked here by Judith, on the re-analysis of construction costs for nuclear, and also the one about the decreasing revenue costs of wind and PV as their penetration increases. Rud, maybe they’re just being exquisitely polite about the intermittency thing. You don’t like to tell a bloke his fly is open, do you? The fee could add as much as 25 cents a gallon to the cost of gasoline…. One of the problems with a tax of this nature is that it falls disproportionately on the poorest of households. A tax that takes a larger percentage from low-income people than from high-income people. A regressive tax is generally a tax that is applied uniformly. This means that it hits lower-income individuals harder. Some examples include gas tax and cigarette tax. For example, if a person has $10 of income and must pay $1 of tax on a package of cigarettes, this represents 10% of the person’s income. However, if the person has $20 of income, this $1 tax only represents 5% of that person’s income. Sales taxes that apply to essentials are generally considered to be regressive as well because expenses for food, clothing and shelter tend to make up a higher percentage of a lower income consumer’s overall budget. In this case, even though the tax may be uniform (such as 7% sales tax), lower income consumers are more affected by it because they are less able to afford it. Yeah but it’s only 1% difference from highest to lowest quintile. The chart vertical scale is misleading. It would mislead in the other direction if it were compressed to show greater percentage range on vertical scale. The chart author reveals his bias in the choosing. But I guess speculation trumps reality. That is what global warming and demonization of the oil companies has been about all along, right? With or without the help of Al Gore at the helm– George Bush could only delay the inevitable — the tobacco model of taxation is being realized. That is what the Left has been about all along. That is where the country has been heading: increasing the cost of production of all goods and services with the money going to fund a metastasizing secular, socialist government grown too big to fail and with the government-education complex helping to stab the productive in the back in the process. I’ll call my congressman and explain that if he votes for a higher gas tax I will campaign for his opponent. Heard this on the debate this evening and doubted it’s veracity, but then found this. Still not sure, but it seems more likely. I don’t need to bother any of my reps on how I’d like them to vote. There’s only one choice they make about higher federal taxes in the Republic of Texas- not just no but hell no. Unfortunately, Jakob Schlandt and Lion Hirth, authors of the referenced article, seem to be blissfully ignorant of all this. 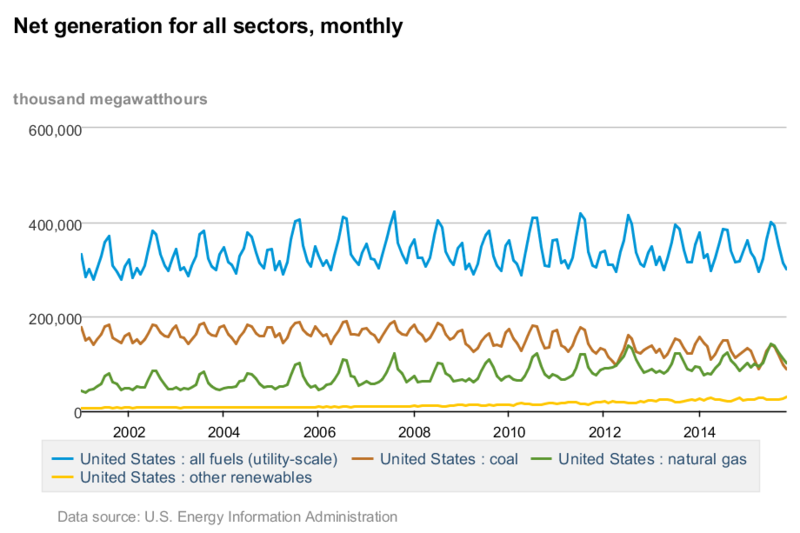 I suspect that, if markets were allowed to work, the utility value of wind and solar would be quite low. This is because of its intermittency, creating the need for almost 100% backup from redundant, backup sources. Germany in 2015 offered an example of this, when for over a week in January generation from wind and solar fell to almost nothing. This explains why environmentalists so frequently inveigh against the market, preferring electricty values be set by the state instead, using a normative theory of value. A thing is worth what someone will pay when they don’t have a gun to their head. Time has come the end the subsidies and mandates for renewable energy. We are going to end up using Chinese nuclear anyway. Why waste money on expensive unreliable short-lived Chinese renewables today? WaPo on ethanol mandate. Could have been a lot more precise. Some ethanol in gasoline is good. First, it replaces toxic MBTE as an octane enhancer. Second, it is used as an oxygenate to reduce smog in places like LA. And the impact on food is small. The 41% of corn for ethanol yields 27% yeast protein enriched distillers grain, a superior animal feed. But in the most extreme cases, less than 10% ethanol needs to be added, which is why the 10% blend wall, and why all cars are designed to handle up to 10%. Anything more like E85 is pure farm lobby pork. The ethanol mandate to be removed was contained in EISA 2007. It contemplated growing amounts of cellulosic ethanol (Bush: switchgrass) to cut down on imported oil (Energy Independece and Security Act). Cellulosic ethanol has not come to pass. Range Fuels failed and took $250 million with it. There are only two plants, both heavily subsidized, using corn stover as feedstock. That stover should be left in the fields to enrich the soil. Hence corn ethanol has to fill the mandate. The EISA purpose itself no longer makes sense because of the development of fracked shale oil. Cruz was courageous to call for the ethanol mandate elimination before the Iowa caucus. EtOH does not belong in gasoline, it belongs in our bloodstreams. It’s benefits are reduced by the decline in mileage. This is one of the reasons the Federal government needs to be reduced in size. There is so much waste (like the biofuels programs) that it is self protecting. The amount of waste makes it hard to figure out where to start,cutting and once you do, there is a constituency for all the waste, Trying to cut waste is like taking on the Blob. If the federal government is reduced in size the constituencies fight it out among themselves and do the cutting for you. Plummeting costs for renewable energy have finally made solar and wind a viable alternative to fossil fuels. A great deal of empirical evidence indicates that the main factor that makes “solar and wind a viable alternative to fossil fuels” is government intervention, either through generous subsidies for wind and solar or by breaking the kneecaps of competing fossil fuels. Germany’s Energiewende offers us yet one more example of this — the way new solar installation collapsed once the exorbitant subsidies for it were done away with. Glenn, the German economy is booming. Germans accept the energy revolution. It wasn’t what you wanted, but it’s happening anyway. Get over it, and move on. If you believe “the German economy is booming,” then you’ve got a mighty strange notion of what the word “booming” means. I hardly consider the U.S. economy to be “booming,” but it’s outperformed the German economy. And if the “Germans accept the energy revolution,” then why is the government phasing out subsidies for renewables? Why, as the graph above illustrates, have new PV installations all but ground to a halt? Glenn, look at charts before you post ’em. See in your chart how Germany GDP growth has been gaining on U.S. GDP growth. Looks like if the trend continues German growth will surpass U.S growth in 2016. Not saying it will, but it could. My guess is you have some kind of ideological commitment that makes you want to see the German energy revolution fail. I don’t think that’s nice, but I can understand it. Ideologies are hard to shake. 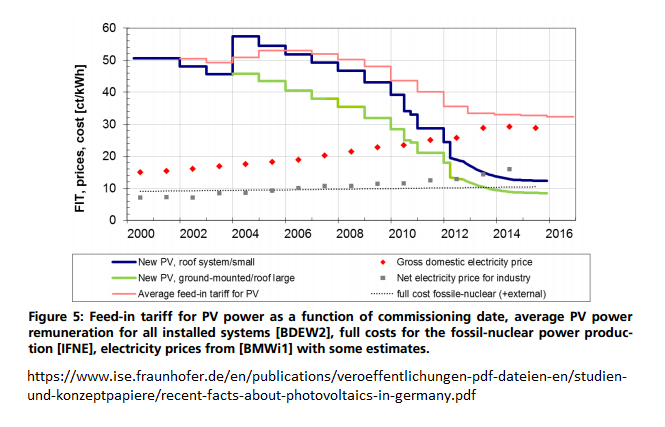 No, they don’t!… the green intellighentsia had foreseen 2,5 GWp to be installed in 2015, as per Energiewende “revolution”… but as the two graphs linked above clearly show, a lot less has been installed by the very same German citizens. Whether you like it or not, Europe as a continent has already reached “peak PV”, this technology is over in this continent… will be an “also ran” forever. Whether you like it or not. Don’t take it personally, Max, but I have the impression that you are too much “citizen” and not enough “scientist”. Robert, here is some math you might like (or not). Germany’s unemployment rate fell to 6.2 percent in January 2016, the lowest level since German reunification. If you are a fossil fuel luddite you might prefer the unemployment rate to be at the highest level since reunification, so you could say the energy revolution is wrecking the German economy. The Energiewende is German coal, North Sea oil, Russian gas and other fossil fuels. Full stop. The rest is expensive decor and creative accounting. Say “bridging”, “Merckel”, “anti-nuclear”, “transitional” if it makes you feel good. But it’s fossil fuels. Evidently it can’t be solar panels at 50+ degrees north making those Mercs (or those solar panels!). And can you guess what “other renewable” might be? Just don’t approach with a lit match. It was fossil fuels, it is fossil fuels, it’s going to be fossil fuels. So it’s a very great pity about the nukes. The no-nuke thing was an excuse to dig more brown in new fields, which is exactly what is happening. As a bushie conservationist and curious guy, I like solar, wind, geothermal and such handy alternatives. But can we stop pretending they are what they clearly are not? The results are very unimpressive. I do seem to recall reading about German wind making some big gains in 2015, but I can’t seem to find it. Yes, wind power in Germany has beaten all previous records, thanks to several GW of off-shore turbines finally coming to production, and the two huge atlantic storms hitting north Germany early in 2015. It’s intermittent, let’s not forget it. I found an interview of an environmentalist, Michael Shellenberger, president of the Breakthough Institute, on YouTube the other day. He actually admits the phenomenon discussed in the article, that people don’t want to live anywhere near wind turbines, and consider them to be a blight on the landscape. In fact, he admits a lot of things and doesn’t succumb to the nihilism and Prometheanism that entirely too many environmentalists do. Do you have an figures on house prices where you can see a coal power plant from a window? Nuclear plant? Comparing coal and nuclear – see Toronto. Low near coal pants, high near nuclear plants. In Australia, wind turbines are greatly reducing land values. There lots of figures. You can do the search yourself. The reality is quite different from the spin that Team Green puts on things. That is just new construction, which is very small. Misleading hype as usual. Fossil still accounts for most of power generation, and will for the foreseeable future. DW, worse. Check Bloomberg. They cite nameplate. Have to derate by capacity factor to get the actual capacity installed. i understand, but nameplate normally is what is called capacity installed. Your “actual capacity” is a variable performance metric. While it is arguably far more important than nameplate capacity, it is not what is meant by capacity installed. The article is not wrong, just very misleading. The advantage of a nameplate capacity is that it never changes. Long days in summer or short days in winter do not matter for solar. Nor do panels ever get dusty or less efficient over time. Another Bloomberg misdirection. True only with respect to nameplate capacity. Caused by the rush to install before the renewabletax credit subsidy expired, as the article itself points out. Without which no renewables get built. Now derate by capacity factor to get actual energy production capacity from that new capacity. Solar in the southwest, about 22-25%. US wind about 30-31%. US CCGT, >90%. No way has new renewable generation capacity surpassed new conventional capacity. If we take a look at the amount of electric power actually produced from different sources, renewables’ share increased from 7.04% in the first 11 months of 2014 to 7.43% in the first 11 months of 2015. 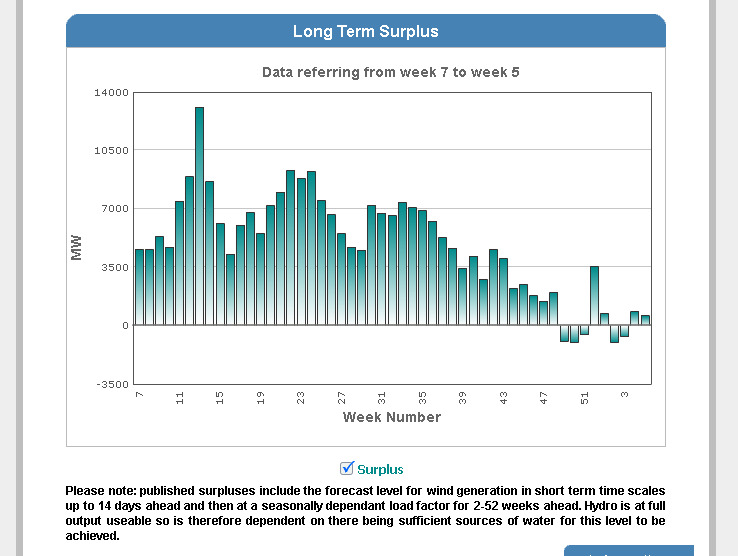 Hydroelectric Pumped Storage appears interesting! It’s the trend that matters and I see the underlying technologies continuing to improve, costs continuing to go down, and adoption continuing to increase, But we will see..
1) Wind does not eliminate the need for fossil fuel or nuclear plants. This is so because wind is intermitent and 100% backup from fossil fuels or nuclear is required, necessitating the construction of these facilities. They are necessary for when the wind doesn’t blow or when there’s icy weather. I am for am for all of the above approach. Wind, Solar, nuclear, hydro and more research on biofuels, battery technology, and energy efficiency, etc. With a global effort I think we can get there. Steve Millory of Junk Science has belatedly realized that the agreements reached at the Paris Climate Conference may be legally binding on the United States. What a rude awakening to reality! Definitely. The President is the ultimate lawmaker; the Congress does not count. Fred Krupp had an op-ed in the WSJ on the importance and benefits of significantly reducing methane leaks. http://www.wsj.com/articles/fixing-the-methane-leaks-that-deflate-natural-gas-gains-1454541892. That makes sense in any case. “Recent studies indicate that existing technology can cut methane leaks by between 40% and 54% at an average cost of a penny per thousand cubic feet of gas produced—about one-half of 1% of today’s price for that much gas. Stopping at least 45% of leakage globally would help the climate over the next 20 years as much as shutting down one-third of the world’s coal-fired power plants.” Question I would throw out is – a lot of methane leakage is not accounted for in the climate models forcings and determination of climate sensitivity. As he says, “methane is 84 times more potent that CO2…” If that is the case and the climate models have understated the methane contribution how much proper accounting of methane decrease (even further) the calculated contribution of CO2 and climate sensitivity based on the “official” temperature readings? Some partial answers. GCMs do include non-CO2 forcings such as aerosols (negative) and methane (positive). The methane forcing is based on measured atmospheric concentration. The 84X CO2 is offset by the facts that the residence time is about 8 years (methane oxidizes to CO2 and H2O) compared to maybe 50 years or more (opinions vary) for CO2, and since there is much less methane than CO2 in the atmosphere in the first place. So methane is a little deal, not a big deal, and is accounted for in model sensitivity. A lot of these methane ‘leak’ estimates are pretty sketchy. Much more methane is produced by methanogens (ruminent stomachs, landfills, swamps, summer tundra) than leaks from the natural gas infrastructure including wellheads. After all, the industry is trying to sell the natural gas, not lose it to leaks. At oil wellheads where it isn’t economic to capture via pipeline and sell, it is either reinjected to maintain field pressure and lower oil viscosity, or it is flared. In which case it is no longer methane, but carbon dioxide and water vapor. The residence time for CO2 molecules is less than 5 years, thanks to the huge natural flux. DW, perhaps you can enlighten. But not via Murry Salby, who is just off. I spent some considerable time on this, since the definitions are confusing and do not all mean the same thing. On bomb spike C13? you may be about right. I have archived sources anywhere from 5-14? years depending on the sediment core, location, etc. McIntyre has posted stuff since bomb spikes help date core tops. I used bomb spike dating in my Marcott guest posts. But that just says how long (half life) an individual molecule of CO2 is resident in the atmosphere. The relevant AGW question for CO2 as a GHG is the efold residence time (sort of more than a half life, roughly a 2/3 life) of the entire population of atmospheric CO2 molecules as the planet inhales CO2 (sinks of varying rates and durations, from trees to limestone) and exhales CO2 (biomass decomposition, anthropogenic combustion of fossil fuels, tectonic subduction zone volcanos…). I have never seen a satisfactory answer to the latter. Just dunno. 50 years is sort of in the middle of the latter papers I have read, with huge error bars. The only thing I do know is that the Bern model of saturated carbon sinks relied on by IPCC (hence very long residence times) is just wrong. Planet is greening: NVDI and coccoliths. Those are net sinks. Please help educate us denizens further. A lot of these methane ‘leak’ estimates are pretty sketchy. Much more methane is produced by methanogens (ruminent stomachs, landfills, swamps, summer tundra) than leaks from the natural gas infrastructure including wellheads. Thermogenic ch4 is distinguishable from biogenic emissions due to the concomitant increase in ethane. We are going to see the usual complaints from Republicans about 25 cents per gallon making gas unaffordable for poor people. Don’t take their word for it. Do the numbers. The average person’s gas would increase by less than 50 cents per day, and that is if they have a car, which means all their other associated costs dwarf this increase. It wouldn’t be noticed. Gas prices regularly go up and down by 25 cents per gallon in the space of a month, as anyone in the US knows, so it would be in the noise and their gas taxes are still far lower than Europeans have had for the last few decades. If the cost to the consumer is so negligible why didn’t Obama and the Democrat controlled Congress do this smart thing 7 years ago? I will help you, because Obama wanted to get re-elected. Now he has put poor hilly-billy on the spot. Bernie will embrace and might even up the TAX. The two-for-the-high-price-of-one dynamic duo of scheisters, hilly-billy, will try to avoid the subject. Your pronouncements are almost as pompous and amusing as they are erroneous, yimmy. Thank you. Jim D’s response would be to take away cars from the poor. That way no impact. Yimmy will give them electric cars and they won’t have to buy gas. Is there any other tax on a gallon of petrol or is this 25 cents the first? How much is a gallon of petrol in the states these days? Apparently there are state and US taxes that add to about 50 cents per gallon already. The current price is about $1.55 where I am, the lowest in years. It varies around the country. This translates to about 20-30p per liter. Tony, the present federal tax on gasoline (and I think diesel also) is $0.184/gallon. It goes to the Federal Highway fund to maintain highways and bridges, is inadequate since has not been changed in decades. Obamas oil tax proposal would go to fund suburban transit systems, high speed rail… All the stuff that is supposed to get people to give up automobiles and light trucks, but in fact doesn’t in the US because of the country’s size, penchant for suburban sprawl, and fondness for light trucks just in case you need it one day. So his proposal is double DOA. Doesn’t fix the aging infrastructure problem, while throwing wasted money at wishful progressive transit ‘solutions’ that do not have the desired effect. My own fondest example is Washington DC’s light rail system to Reagan airport. Compare its use to taxis, the usually chock full massive multistory parking garages, and of course the special extra convenient 1000 car lot reserved for Congess and its ranking staffers. Just stand at the light rail entrance at the Garage C portal, and count its users compared to people going to/from just that 1 of four garage portals. If Obama had said we are going to put the tax money toward renewing transportation infrastructure, I would personally be all for it. So lessn one is that once a tax is levied it is easy to increase it as the consumers have no practical way to avoid it. The second consequence is that it will impact on the price of goods as everything is basically moved by road. Wth petrol prices so high people travel much less and use much smaller and more efficient cars than in the US . Obviously we are a much smaller country than America so do not travel such long distances and our public transport is better. Trains are expensive though. So my perception is that you are very under taxed so ‘waste’ fuel but this translates to lower costs for goods and more money in your pockets which boosts your economy. Some 50 billion pounds is collected in taxes from motoring in the uk , of which some ten percent actually goes towards the road infrsastructure. Much of the rest disappears into the general tax pot. So a small tax to fund transport infrsastructure improvements is not a bad idea if it is hypothecated and doesn’t disappear elsewhere. However, as our experience shows, being an easy target and simple to collect such a tax is unlikely to remain small for long. As you have quoted litres and pence we can do a direct comparison. Our cheapest regular petrol is around one pound per litre so we pay up to five times what you do. The highways and bridges would be in better shape if that $9B wasn’t going to Mass Transit. The right way to pay for highways and bridges is with user fees — tolls. If people won’t pay, don’t build it. If it is safe, fast, convenient and useful, people will pay. Tony, the last chapter of my first ebook, Gaia’s Limits, advocated raising gasoline and diesel federal taxes something like $0.25/ gallon every year until the was maybe $2.50-$3. Reason was to wean Amawricans away from unnecessary light trucks and SUVs, away from expanding exurbia, and so on. To offer a soft landing against peak oil production occuring within the next decade. And to do aomething about the acandalous national deficit. And not really as regressive as progressives would argue, since it hits most those who are most responsible for the entitlement based deficit spending in the first place. With respect to US shale oil, at the rate it was being exploited before the Saudi price war, US production would have peaked by 2021 and crashed in the three following years because of the steep decline curves. It is not like the shale TRR is not known reasonably well. Given the China slowdown and the drop in shale oil drilling rigs, I moved my peak of all oil all sources prediction from about 2023 to maybe 2026. That is still only a decade from now, when the average replacement age of a US vehicle is near 10 years, and the exurbs are still booming so requiring ever longer commutes. San Jose, LA, Chicago, Atlanta, Dallas, everywhere the local economy is expanding so is suburbia and exurbia. Because of the way the US has developed, post peak oil will hit it much harder and sooner than any other OECD country. I worry about that a lot. DC’s Metro transit is one of the best systems I’ve ever ridden. Used to fly into BWI when coming home to visit. Now that my dad is 90 and has pretty much given up driving, we fly into Reagan and take Metro all the way to Glenmont station, about 10 minutes from family. Come to Portland OR. Another success story for light rail. Or try living without a car. Buses and light rail are crucial to folks who don’t have a car. Express busstop is a block from my house in Renton and drops me off a block from work. I drive because of the freedom – i.e. I don’t have to schedule based on transit schedules – not because it doesn’t work. timg56, the DC system is also one of the most gold plated in the country. Have you done my relative usage research at Reagan? I have, cause used to commute to DC to tend my then aging father. 10 years of that, several times a year. Your comment about a wonderful Portland Oregon public transit system ( in one of the greenest states in the land)– which you don’t use out of personal schedule convenience, merely proves my general point. For 15 years I rode the METRO commuter trains from the North Shore into downtown Chicago every day I was in Chicago rather than traveling. Then walked the 4 blocks in winter to my offices. Know something about schedule convenience versus commuter gridlock. Not naive. Boy, talk about your blazing non-sequiturs! You start with poor people, and then shift to average. The people hurt most are the entrepreneurs who drive trucks: plumbers and electricians, long-distance truckers; and anybody who buys goods that have been manufactured or shipped using fuel. The below-average earners would be hurt more than the above-average earners. For all fuel purchases, directly or indirectly, such a tax increase would take more money from the economy and give it to the government, which already takes more than enough. It would immediately depress all economic activity that is paid for after people have paid for their fuel. I don’t know if poor people drive less than average. Do you? I didn’t want to assume that, but if they do, the impact is even less. Also this idea of transportation costs comes up all the time too. Work out how much extra your pack of frozen peas costs when a truck ships them to your supermarket. It is not much. Like I say. Do the numbers. Don’t take my word for it. Jim D: Do the numbers. Whatever is the total revenue increase to the government from the tax, that is total purchasing power lost to the rest of the economy. Government money also goes to the economy through building infrastructure, research and development and supporting industry. Jim D: Government money also goes to the economy through building infrastructure, research and development and supporting industry. Well it could, but the Solyndra executives (to pick just one example from Obamanomics), moved their money offshore after the US suffered a net loss on the transaction. Even when it does, there is no guarantee that it benefits the taxpayers any more than keeping their own cash would have done. Whatever, the cost is administered first, and the hypothetical benefits occur later if at all. One of the very few times where you’ve commented and I’ve not fully agreed. And here it’s a matter of narrowing to “and anybody who buys goods that have been manufactured or shipped using fuel.” which means (as the rest of your comment states clearly) that the below average earners are hurt more. On another thread I’d linked to the WAPO article and suggested that the tax should be flexible by being reduced when market forces (whatever that is when it comes to oil) cause price increases, and the tax rise when market forces prompts prices to fall. This would be less regressive (and easier on those with lesser earning power). The current plan is for the tax to ‘phase in’ over time and this does not consider ‘externalities’ when it comes to price. Once a downstream price increase on goods/services purportedly due to increase fuel expense is implemented it never seems to ratchet back when those fuel expenses fall. I also an average person. Don’t like being nickeled and dimed to death by government schemes designed to alter my values and my behavior. Poor American teenagers ride boats keeping the fossil fuel flowing to Europe so they than can continue supporting their renewable fantasies. Huh? Why? Because of our politicians’ green renewable mania? If so, then excluding the UK from your derision makes no sense. They are the greenest country of us all, with the most ambitious climate goals of the whole of Europe. Exactly, YOU do the correct numbers. An increased gas tax is payed not only directly at the pump, but most of it indirectly whenever goods that are transported via trucks or vans are considered. The impact is much bigger. Gas prices in the US have already been $2 higher and people got along with it. Adding a quarter has a relatively minuscule effect. That sounds like an expensive process to replace yeast. Making fuel from the CO2 in air or powerplant exhaust is a great idea, but the energy has to come from somewhere. Only with cheap, mass-produced catalysts and really cheap energy from somewhere can the process be economically viable. The Exxon fossil fuel emissions forecast is lower than mine….I had envisioned a peak between 2034 and 2054, and a peak co2 of 630 ppm. Exxon doesn’t discuss the peak ppm, but this depends on carbon cycle asumptions. I sure hope I can get a bit more traction so you can avoid having the IPCC issue another RCP 8.5 look alike as the case researchers use to estimate impacts and create panic. Fernando: Won’t we just go hog wild for coal once O&G is depleted, then hit the RCP8.5 targets before the solid-state fossil fuels run out? I don’t think so. As you can imagine this is a pretty iffy game, but the way I see it coal also starts getting expensive. Placing a limit on fossil fuels requires a guesstimate of technology development and costs for nuclear and renewables, as well as third world nations’ ability to pay for higher fossil fuel costs. In the end one can use a simple approach or a complex model…but most serious work I think makes sense seems to home in on 550 to 700 ppm peak. And a lot of it depends on the carbon cycle issue as well. For example, I don’t see a need to do full decarbonization – the sink simply out performs the source once emissions drop to about 40-45 % of peak emissions rate. The story on what the price plunge in crude is doing to the North Sea Oil business is a microcosm that describes the havoc that is being wreaked all over the world. The consequences for the global economy are very serious and will very likely just get nastier, soon. The growth in the U.S economy and job creation has to a significant extent been driven by the shale oil and gas boom. The recent employment numbers are likely indicative of the kind of more subdued job creation we are going to see this year, rather than the promising numbers of last year. GDP growth disappointment will likely be detrimental to Obama’s legacy and to the election prospects for Democrats. Another big driver of the Obama economy is the latest internet boom. Not looking good there either. In the Telegraph article there is a good discussion on the Red China bosses currency predicament and it’s implications, with a link to another article that is very good. A major part of Trump’s sales-pitch is railing against the huge trade deficit with China and the currency manipulation/devaluation that has historically been used by China to gain advantage. Now they are, for the reason described, spending hundreds of billions of dollars to try to prop up the renminbi, but failing. It’s ironic that the effect is that it looks like the Chinese are devaluing, again. The Wharton schooled Trump knows what’s coming and he is set up to say “I told you so”. I have been telling you all for a couple of years to short China, which also meant to short commodities and the big commodity exporting economies. Watch out below, as China is leading the world into trouble. Saudis are exercising their muscle. They are suffering, too, but not as badly as other oil producers – and all they have to do to stop the suffering is to stop half of their wells. The GDP argument is funny; with oil prices 60% down, the price of everything would ultimately go almost 60% down – and GDP which depends on prices would also go 60% down. We need a better measure than GDP; it is useless in unusual circumstances. Your GDP argument is hilarious, George. You are obviously not a Wharton man. Ask Rud to help you with your math, and such. Obviously. Remember that in 2007 a financial planner’s software could not even accept decreasing real estate prices? The Saudis only have to ANNOUNCE their target price is $60 per barrel and a 5 % cut. On the other side of the war the Russo-Iranian-Iraqi alliance has to force the Syrian and Iraqi Sunni rebel forces to surrender. Isn’t it interesting how Bush’s Blunder has allowed the establishment of a shiah dominated arc from Iran to the Mediterranean? The Russians have achieved their historical need, have client states on a warm water ocean. Obama tried to patch the Bush Blunder with the Iranian deal, but the Israel Lobby stands in the way of a coherent USA foreign policy. Please, fernando. When Bush left office about 7 years ago, the Middle East-North Africa was fairly stable. Now it is a holy freaking mess and the fallout is creating havoc in Europe and elsewhere. It’s still Bush’s fault? Obama’s withdrawal from Iraq, shenanigans in Egypt, his failure to do anything substantive in Syria, and then the brilliant capitulation to the our friends the Iranians have facilitated and assured the semi-permanence of the shia arc that you are talking about. Are you aware that Russia and China were sitting on our side of the table in the “negotiations” that led up to the capitulation? Do you really think they were working to advance our strategic interests? Did you notice that Russia decisively entered the fray on the side of Assad, before the freaking ink was dry on the capitulation paper? Oh wait, it’s Bibi Netanyahu’s fault. I forgot Lybia. That mess is also Bibi’s fault. Especially Benghazi. I forgot how to spell Libya. But they will undoubtedly change the name to something to do with islamic caliphate of something or other. Depends on which radical islamic terrorist group wins the war. When Bush left office about 7 years ago, the Middle East-North Africa was fairly stable. Come on Don.. The Iraq war gave Al Qaeda and other extremists a foothold in Iraq. To say the Iraq war was good for us in any way is laughable. You always lie about what I say, yoey. I didn’t say the Iraq war was good for us, in any way. Everybody can see what I said. If we had pulled completely out of South Korea after the “armistice”, we would very likely be looking at a much bigger problem now, if we still existed. If we had left a force in Iraq big enough to give the Iraqi military effective support and a backbone, we would very likely not have the mess we have today. Stop lying and try to use your head. Learn to read what people say, not assert what they say. A better interpretation of Don’s comments might be that “Any positive gains resulting from the Iraq war were squandered by the following administration.” That is not the same as saying the war was good for us. the problem for the chinese is devaluation risks unsustainable capital flight. Capital flight is already a huge problem because the capital holders over there are rightly looking around and realizing many of the structural adjustments necessary there (reduction in debt overhang, filling the black holes on bank balance sheets and shifting to consumer-driven economy) will be addressed by wealth transfer (to banks and households). Failing to change the structure also risks armageddon as return on capital will be below debt servicing cost. The Chinese govt is clearly aware of these things because they are proposing a new round of “supply side” reforms designed to achieve the transition goals without the direct wealth transfers. Need to also defend the currency to convince local vested interests to not flee. Daunting high-wire act, successful completion of which I’m dubious of in the medium-term. But I see in the short term the dollar falling as fed backs off its insane tightening crusade, which should help commodity prices at least temporarily. Difficult to disagree with anything written in the telegraph article. My particular bugbear is q.e. You are still earning your money the old fashioned way silly. The smart folks just spend what they can get their hands on, at close to a ZIR. Buy low sell high and all that stuff. You are always going to be a ‘Limited Partner’ in their current business plan. It is for our own good to be sure. Is it possible that between the T and the FED, they have created a Bond Ladder, over the past ten to twelve years? I wonder. A time tested way to reduce your interest rate risk. We will see. Socialists get really desperate when they are about to run out of other people’s money, Tony. Create some more money and kick the can down the road hoping they will be dead, before the dookey hits the fan. Socialists are spending all of Don’s money. What can poor Don do? Well, if I were him I would spend everything I have real soon so those socialist won’t get any more. Then become a socialist. Don isn’t poor any more, Max. I possess the financial and intellectual resources to survive and prosper, despite the socialists. And I can always move to someplace where I have the power and influence to avoid their foolishness altogether. I’ll take you along in exchange for a reasonably large percentage of your assets. Don thanks for the offer, but I can’t think of a country without socialists where I would care to live. My advice to spend your money quickly is good for another reason. Otherwise, you end of leaving a lot to relatives who may be socialists or worse. Just estimate how long you will live and spend accordingly. One caveat: don’t outlive your money. I didn’t say there were no socialists where I might live happy and free from onerous socialist rules and taxation, Max. It’s just that they are irrelevant where I would be going. They are outflanked and outgunned by the oligarchy and the communist rebellion. I am covered on both sides. It’s easy for me to make friends with serious people, Max. Below is from Nuclear Power in the USA http://www.world-nuclear.org/information-library/country-profiles/countries-t-z/usa-nuclear-power.aspx – scroll to ‘Life extensions and regulations’ or click in ‘Contents’ on right for more. “By December 2015, the NRC had extended the licences of 81 reactors (77 still operating), over three-quarters of the US total, and about 30 were actually in their 40-60-year age bracket. The NRC is considering licence renewal applications for 13 further units, with more applications expected. Hence, almost all of the US power reactors are likely to have 60-year lifetimes, with owners undertaking major capital works to upgrade them at around 30-40 years. For instance for Davis-Besse, renewed in 2015 to 2037, the owners had invested almost $1 billion. The licence renewal process typically costs $16-25 million, and takes 4-6 years for review by the NRC. 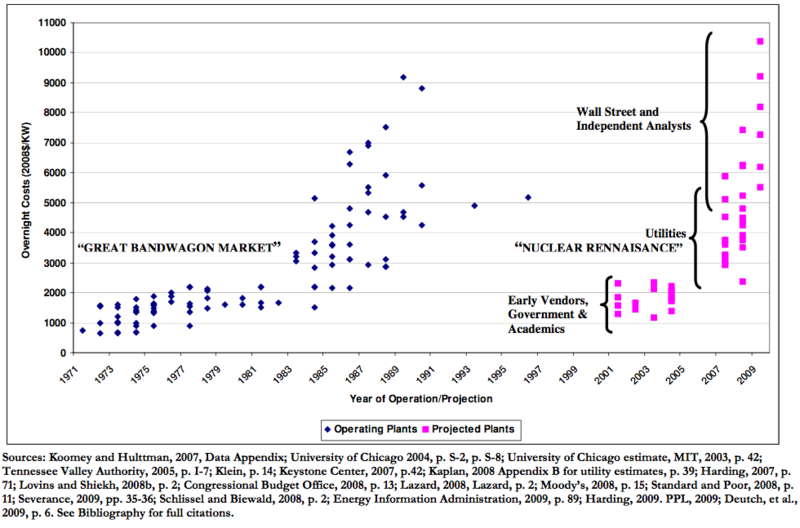 The original 40-year period was more to do with amortisation of capital than implying that reactors were designed for only that lifespan. It was also a conservative measure, and experience since has identified life-limiting factors and addressed them. The NRC is now preparing to consider extending operating licences beyond 60 out to 80 years, with its Subsequent Licence Renewal (SLR) programme. The first applications are expected before 2020, and Dominion has already advised NRC of its intention to apply for a second 20-year renewal for Surry in 2019. PL, but is this wise? Certainly the operating extension to Fukushima Daichi was not wise in hindsight. Obsolete design with inadequate safety margins. l know of no viable factory in the US or Europe (where I have extensive manufacturing consulting expertise) that operates with the same equipment it did 60 years ago. Flint Michigan tried that with its water pipe system, and that has not ended well. The average age of US coal plant generation retirements due to commercial obsolescence is 48 years, and has been since 1995. Look, I dunno. But it is seemingly a lot more worrisome than you portray. 3 Mile Island #1 is still operating. Should it get an extension given what happened to #2? Any time the US government assures us there are ‘robust’ programs focussing on something, I run for the hills. The EPA had a robust program for the Gold King mine seepage problem in Colorado. The ATF had a robust program for Operation Fast and Furious (Mexican narco gun smuggling). Obamacare had a robust program for its mandatory insurance exchanges…. Rud, bit O/T but not able to reply to you above- what’s your take on Saudi price war? Bloomberg had a piece this week that much of us shale is still profitable and will remain so at even lower prices. Cushing is getting close to capacity and only new well drilling has materially stopped. Does this play out this year or do the Saudis capitulate or dig in for longer? Bloomberg’s view that shale is still profitable at $30/bbl is just off. Way off. No different than the Bloomberg Sandy was climate change headline. Depends on leased ‘sweet spots’. Shales do not produce the same oil per mile of horizontal frack–surprise, not). Average break even appears to be between at least $65 and $80/bbl based on rig counts and prior reported financials. My personal swag. Still cheaper than deepwater and Arctic. Saudi’s know all this stuff. They instituted a calculated price war to enforce ‘market discipline’. Most of the Saudis in charge were educated at Harvard and Wharton. I have been over there, discussing such stuff with them. Do not bet against them unless you want to hold a losing position. Here’s a pretty good summary of the oil situation. Shale producers are hurting, but the Saudi’s budget is bleeding huge amounts of red also due to social spending. They need $100 bbl to support social spending of the recent past, this even though they can produce oil at $10 or less. I expect some shale producers will go bankrupt, but someone will pick up the properties on the cheap. The oil will still be there and will still get produced. Consumers are in for cheap energy for a couple of years. Thank you for raising this discussion point. If the NRC (often called Nuclear ‘Rejection’ Commission) has approved the extensions, then I think it is probably reasonable to proceed, taking all the long term costs, benefits and risks into consideration. We need to encourage investment and innovation to move forward, not continually reject progress on the basis of fear and prejudice. We need to move past the stage that is equivalent to England’s road rule that required any motorcar using a public road must have a person walking way ahead carrying a red flag to warn oncoming horse drawn traffic of the car’s approach. The actual to date and probable future health consequences, of Fukushima are negligible. The vast majority of the consequences, including the huge cost, are due to overreaction to the accident. Nuclear is the safest way to generate electricity. Therefore, anything we do to block or slow its development is coasting lives – about 1.3 million fatalities could be avoided per year by replacing coal with nuclear. More if we replace other technologies too. My proposition is that we should focus on removing the impediments that are slowing development and also slowing the rate that safety improves and costs reduce. We need to move to Small Modular Reactors to increase the rate of development and improvement (but this will take decades). The scaling up of nuclear power plants over the past 5 decades or so was in part a result of the huge cost of licencing and safety requirements which caused huge operating costs per plant. It was cheaper to make larger plants. This was the essential because of the public’s paranoia, but exactly the wrong approach to get the fastest learning rates and reduce costs and improve the designs fastest. It was caused by the effectiveness of the anti-nuke protesters (the equivalent of those people who demanded the red flag be carried in in front of the car on public roads). l know of no viable factory in the US or Europe (where I have extensive manufacturing consulting expertise) that operates with the same equipment it did 60 years ago. Point taken. But the larger the products made by the factory the slower the rate of change. How many of the factories you deal with are making products that cost billions of dollars? I’d also point out that hydro plants last over a hundred years, and hydro kills many more people than nuclear per MWh. The Russian hydro plant failure a decade or so ago killed 70 people when a log went through the trash racks and the turbine exploded (more than the confirmed fatalities attributed to any civilian nuclear accident). The average age of US coal plant generation retirements due to commercial obsolescence is 48 years, and has been since 1995. The coal plants are shut down when they are no longer economically viable, not because of bureaucratic regulations and licensing requirements. The same should be the case with nuclear. I say, get the bureaucrats out of the way – to the extent possible and justified on the basis of AHARS instead of ALARA (As High As Relatively Safe instead of As Low As Reasonable Achievable). Whether or not Three Mile Island should be closed will be decided by the NRC. It should not be up to a public pole. Eventually, when we have SMR’s, the decision should be entirely commercial with regulation equivalent to that in the aviation industry. Any time the US government assures us there are ‘robust’ programs focussing on something, I run for the hills. I agree. Get the bureaucrats and licensing out of the way and allow the nuclear industry to improve the breed as has been done with the aviation industry. Because of the culture and competitive nature of the private sector aviation industry, it has improved its safety (fatalities per passenger mile) buy a factor of 1000 since 1960. In the same time, the overly bureaucratic health industry’s safety record has been poor: http://www.theaustralian.com.au/opinion/columnists/nick-cater/more-money-is-not-the-answer-innovative-thinking-is/news-story/85fa62d7d35a0c3b178ee9e53dc16b32 . US air travel passenger miles has increased 20 fold since 1960. Air safety (fatalities per passenger mile) has decreased by a factor of 1000 over the same period. Would this massive improvement in safety have occurred if the aviation industry had been strangled by excessive regulation like happened to the nuclear industry over the same period? The regulation and safety record of the commercial civil aviation industry has lessons for regulation of the nuclear industry. Consider where air travel, business, commerce, trade and the global economy would be now if, when the Comet airliners were crashing in the 1950’s, politicians and bureaucracies had excessively regulated aviation as they have done with nuclear. Air fares would have been very much higher and passenger-miles perhaps 10% of what they are now, business trade and commerce and the whole global economy would be worse off. With 10% of the development over 55 years, would aviation safety have improved as it has? I’d suggest not. There would have been nowhere near as much progress as there has been. Aviation progress would have been held back just as nuclear progress has been held back for 50 years. IMHO, appropriate deregulation of the nuclear industry is what is needed. Deregulation would remove the massive impediments that are preventing the world from having low cost nuclear power. If the unjustifiable impediments were removed, competition and innovations would take off; technologies would improve faster, safety would improve and costs could be expected to decline at around 10% per capacity doubling (typical for other electricity generation technologies over the past 100 years or so). Rud is correct. The Bloomberg article is fairly useless. Actually, worse than useless. It gives you a vague glass half-full hypothesis that is more anecdotal than analytical. Some of the oil is still profitable in Texas. So what? How much of the oil is profitable enough at $30 for the companies to service their debt and make investments? The bottom line is that companies are going under, left right and center. The Saudis are winning this round. It’s a lot more than scores of roughnecks who have lost there jobs. Two out of three drilling rigs in the U.S. shut down. And they don’t even mention the debt service and yields rising on oil company bonds. Or the cushion that companies had for about a year due to forward selling contracts. It’s getting ugly. The glass is not half-full. The big boys will buy up the bankrupted cos. and do well somewhere down the line. The cnbc article underestimates the Saudis. Their cost of production is very low. They are cutting spending. It looks like they may sell shares in Aramco. They can borrow a lot of money. They are not going bankrupt. Last time I was in Saudi Arabia I was told their ongoing operational cost of production is about $2 a barrel. Monfort understands the oil and gas business. Thanks guys. I think the Saudis have staying power- still have most of their fx reserves (700b) and are looking to tap bond and equity markets to raise money this year. Also, as Don says they can get more ruthless domestically and are cutting spending. The BBerg article threw me for a loop because of the other reports out of Dakotas and Texas about economic stress. Personally, I think it has been great for the average American. 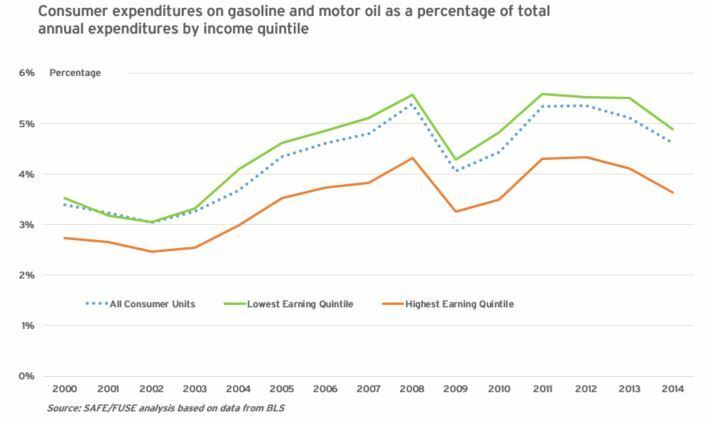 EIA has avg household saving $750 last year on gas and Midwest and northeast hh’s an additional 750 on heating costs. That works out to be about 0.50% of GDP after factoring in spend rate of savings (JPM did big study, concluded 78%). Explains outperformance of US economy last year. Gdyoung, I predict that we will give back more than 0.50% of GDP due to the consequences of the price plunge. Over the past year, Texas added jobs in 9 of the 11 major industries, including professional and business services, trade, transportation and utilities, leisure and hospitality, education and health services, construction, government, financial activities, information, and other services. Pre-recession Texas employment peaked at 10,639,900 in August 2008, a level that was surpassed in November 2011, and by November 2015 Texas added an additional 1,242,700 jobs. . The U.S. recovered all recession-hit jobs by April 2014 and by December 2015 added an additional 4,877,000 jobs. Texas and the nation returned to economic growth in 2010, 2011, and 2012. In calendar 2014, Texas real gross domestic product grew by 5.2 percent, compared with 2.39 percent for the U.S.
Gdyoung1, the shale plays have very steep decline factors. Operators can hang on producing existing wells at $30 per barrel. But they can’t justify drilling new wells unless price expectations rise above say $60 per barrel. There’s a large stock of wells drilled but left un completed, they can be put on production at an intermediate price (say $50). Then there’s well numbers, at $60 there will be minor activity, at $100 there will be more (duh). I notice there’s a lot of focus on USA shales, but the price war also impacts other producers. Heavy oil can’t be developed at very low prices, the same applies to the infill drilling and EOR being done in other countries. The Saudis are playing with fire because we may see capacity drop below demand but the industry may not be able to react, which will drive prices into the $150 plus levels within five years. “Operators can hang on producing existing wells at $30 per barrel.” Except for the many who are not making enough profit to fund continuing operations and service their debt. Root cause analysis following TMI accident determined primary cause was due to operators not understanding what was occurring. One of the causes was the layout of instrument controls in the Control Room. My dad had been contracted to review the I&C layout in the Control Room prior to these plants coming on-line back when they were constructed. He told us that the results of the NRC’s investigation pretty much mirrored what he reported. The utility at the time thought it would be too expensive to redesign the control room layout and didn’t want to delay the plant from coming on line. The layout issue was addressed after the incident. Does not follow that life extension means the plant is economical. As we have seen, a number of nuclear units have been shut down because the units cannot compete, even with their loans debts ostensibly paid-off. Davis-Besse is a “stranded” assets according to rate filings. That means it cannot compete in an open market and must be granted rate relief. As for the small reactors, no real reason to believe they will fare any better than their larger brothers. As small as these units are, hard to justify not just installing a gas plant at a vastly lower cost ($/kW). If it can’t compete, the owners will shut it down. The fact they’ve applied for the extension means they think it is worth spending the money on the refurbishment an uprate. But American shale oil and gas isn’t cheap because it’s produced by a relatively expensive means called “fracing.” If the prices of oil and gas a few years ago were as low as the prices are today, fewer fraced wells would be pumping . High prices drove fracing. If the US wants a greater supply of domestic production, and therefore energy independence, find a way of making oil and gas more expensive to users. How about an import tax? I spell words the way I want to. Which of my custom-spelled words do you not understand? We need an Obama tax. Tax him into poverty. CG, Max’s spelling is the correct spelling of the word in the oil and gas industry industry. Fracking is a non word that is supposed to describe the process of fracturing the sub terrain and injecting with water to facilitate the removal of oil and gas. I guess we are referring to the slang terms for hydraulic fracturing? By the way, hydraulic fracturing isn’t a real issue, the problem is total well costs, the shape of the production curve, the cumulative production, and oil quality (the oil tends to be extremely light, which can reduce prices). Google hits: oil fracing, 106,000. Oil fracking, 11,700,000. After slogging through this article, for me, the take home point: an electric hotplate to make porridge and an electric kettle to make a spot of tea gives the most benefit with the least harm to…People. Dockery et al, from Harvard School of Public Health 30+ years ago demonstrated that girls who stayed in the kitchen while mothers were cooking with gas, had more wheeze and chronic respiratory disease. Kerosene was replaced by electricity in our rural South because of: burns; that is, people were getting burned from kerosene stoves and lanterns. Now I admit that you can burn your fingertips on a hotplate. And you can get scalded by the boiling water from an electric tea kettle, but these injuries are at the same rate as in developed countries. Wouldn’t it be great if 3 billion people who now cook with solid fuels, whose emissions are not safe for anyone to breath, would cook with electricity so that they would have the same risk factors as in developed countries? Electricity. No flame, smoke or soot. Love it. It would smell richly of civilisation…except it has no smell. Briefly, in an odd ritual called Earth Hour, some well-off urban dwellers (often the same ones who wear scarves and woollen hats in summer) revert to flame, smoke and soot for ceremonial purposes. Fortunately, there is always plenty of fossil fuel power to enable the ritual to be prepared and to proceed, and vehicles and chemicals are available in the event of fire. Nobody knows the point. But it’s over in an hour – so who cares? You are correct. Electricity is also delivered via a very small pipe that doesn’t leak or blow up. It’s good stuff. Yes, and a rational logic supply crisis, as there is little pumped storage, and near windless nights in winters are inevitable. As well as windless nights the same weather systems often give us sunless days so knocking out solar, which is feeble at the best of times in winter. It would be very interesting to get one of the green groups so keen on renewables -but not on nuclear- to write an article here explaining where they think our power will come from. Monfort, one of ten comments in this thread are yours. Again. The rules just don’t apply to you in your opinion do they? What you have to say is just SO much more important than others. Blowhard asshat. The global rout of oil prices is taking its toll on the kingdom’s bottom line. The country has been forced to cut government spending in its upcoming budget and increase production of crude oil—even though its hardly worth pulling it out of the ground. Still, the world’s largest producer of oil appears on a crash-course for bankruptcy as early as of 2018, according to a new Big Crunch analysis. Could you comment on Freeman Dyson statement in the link below. “There are many theories of ice ages, but no real understanding. So long as we do not understand ice ages, we do not understand climate change.” Is it the case that the is “no real understanding” of the root causes of ice ages? Thanks for all your g8 work, you’re blog is much appreciated. Sorry about the misfire on the link. The chart. The Supreme Court have granted a stay for states that want to stick with non-clean coal power. This is not a decision, just a stay on implementation. Many of these states have Republican leadership that have also refused the Medicaid expansion to help low-paid workers with their health insurance, and also have not raised minimum wage above the small federal level. This is showing a separation of these states that are determined to more closely imitate the third world just to get back at Obama. Your real agenda is clear. It’s all about advocacy for loony left politics – and Obama, the worst US President by a country mile. Those states have said they want to keep their coal, and also want to keep it unclean. Let the other states move to cheaper and cleaner natural gas, but they don’t have to do anything until this is resolved now. A win for their coal lobbies and a loss for everyone else. You can almost guess which states these would be, right? It is completely political and driven by fossil fuel lobbies, and anti-climate-science sentiments trace those same boundaries, not by coincidence. I suspect you don’t understand what “loss” means, not how to calculate it. Yes, you can guess them but it’s how things work. Some ya win, some ya get delayed, some ya don’t win. This was completely expected and will play out over time. The scientists would call it a loss in environmental terms to keep using coal. An environmental loss is everyone’s loss. Wrong answer, Jim D. You clearly haven’t the faintest idea what you are talking about. I know what I am talking about, but you seem not to, and that is just fine.